Word Highlight: Brain Drain - What Do You Mean By Brain Drain? We all have heard this word a lot of times and even used it in conversation and even in writing; however, are we using this word properly? What does “brain drain” mean? However, the word Brain Drain is a term for the large scale emigration of educated, talented professionals from their home country. The emigration of these individuals may result from a present crisis in a nation or professionals seeking better career opportunities and a better standard of living. The subject of brain drain has been one of the most asked questions in the IELTS writing section. 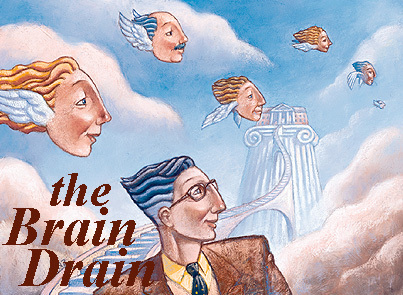 Here’s a sample essay discussing brain drain. Working for one’s own country has been considered patriotic as one serves his or her own countrymen. However, there are some that are not satisfied with what they have here making them leave the country and practise abroad. With this, a country will be experiencing brain drain. Nowadays, finding a job in the country, the Philippines, has been fairly difficult. There are growing numbers of professionals but the demands for these professionals are not enough in the Philippines. Certain professions that are highly in demand in other countries are scientists, engineers, accountants, medical professionals like nurses, doctors, physical therapists, and skilled workers like butchers. Though our country needs these professionals, the amount of job offers are very limited that these talents are put into waste. Hence, they choose to practice their expertise abroad. If these professionals work abroad, how can these affect the country? With every loss of professionals in the country, the supply of such profession decreases. When the time comes where their own country needs these profession, the problem then arises as most competitive professionals are already out of the country working. However, the country can gain advantage from these professionals working abroad. They help the economy in their own little way and at the same time providing recognition to Filipinos as one of the countries with the most hard working individuals and highly competitive with the strict demand overseas. In a nut shell, in any aspect, the issue of brain drain has both advantage and disadvantage. It can be of help as it helps the country’s economy but can be a downside as the county loses its own professionals. For Filipinos, working abroad has been a part of their plan as soon as they finish their degrees in the university. People have different reasons why they would prefer working abroad than here in our country. However, it is more on practicality. Because of everybody wants to provide their own families with a better standard of living where they can live a happier life, Filipinos make huge decisions on working abroad. Since working abroad offers a very competitive salary and better career development, Filipinos choose this career path. Once presented with a good opportunity abroad, Filipinos are sure to work hard on it to become success and attain satisfaction both personally and professionally. download a PDF version of this article at https://drive.google.com/file/d/0BwIiwLcD96zudmgyeV9fSU4xcVE/edit?usp=sharing.